Aïd el-Kebir also referred to as Aid El Adha is the Muslim world’s Festival and the perfect time to travel to Ouarzazate, Morocco. Aïd el-Kebir falls on November 27th, 2009 this year. 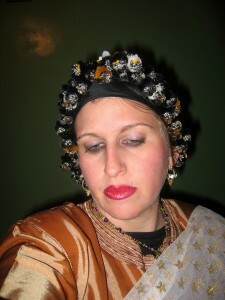 When traveling on holiday to Morocco the best way to see this vast country of Kasbahs and Kilims is during a festival. Participating Morocco’s festivities and customs will enrich your morocco travel experience and bring you one step closer to the people and places you encounter during your journey. Morocco’s Arab and Berber population celebrate Moroccan holidays during the entire year which lend many morocco travel opportunies for the adventurer in you. Aïd el-Kebir, Festival of Sacrifice, or Greater Eid, is a Mulim Holiday celebrated worldwide to commerate Ibrahim’s (Abraham’s) sacrifice of his son Ismael as an act of obedience to Allah (Yarbe) God. At the last minute, as Ibrahim (Abraham) was about to consummate the sacrifice, god told him to stop, a lamb (or ram) appeared nearby, and was offered instead. Today a feast is held to commemorate Ibrahim (Abraham) and his faith, with lamb as the central meat. When possible, a lamb is traditionally slaughtered the day of the feast. 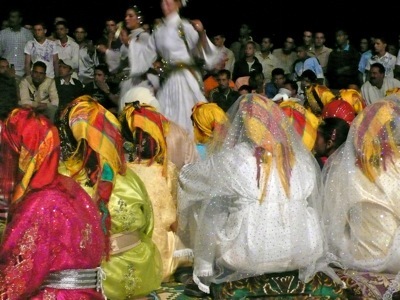 Aïd el-Kebir begins with prayer as do most Muslim Moroccan holidays. Aïd el-Kebir traditionally falls on the 10th day of the month within the Islamic Lunar calendar and the festivities last for three days. Aïd el-Kebir also falls 70 days after the end of Ramadan. One of the most important aspects of Aïd el-Kebir is charity. Aïd el-Kebir is a time of sharing when Moroccan families join together to give to the poor. 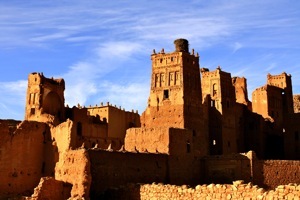 In small Berber villages within the Ouarzazate region such as Ait Ouzzine, Ait Hamou, Agdz and Ait Ourir there are many local festivities that moroccan travelers can experience as part of a Ouarzazate tour. These travel experiences include visiting Ouarzaze’s mystical Ait Benhaddou Kasbah, the Oasis of Fint and Atlas Film Studios, Skoura’s road of one-thousand palms, the Merzouga Sahara Desert, Zagora’s spiritual Zaouia site, visiting Erfoud by pise and foremost spending a day in a traditional Berber villag during Aïd el-Kebir. Participating in Aïd el-Kebir brings great joy and personal fulfilment especially to moroccan travelers who adopt the Moroccan tradition of charity during Aïd el-Kebir. Moroccan travelers can also discover first hand how Moroccans convey their care to each other. During Aïd el-Kebir Moroccans Aid (feast) and everyone is expected to dress in their finest cafdan or jalaba to participate in prayer at the mosque or at home. In Morocco’s Berber villages there is a tradition of sacrifice for the meal, typically a sheep, and sometimes camels, cows or goats. They represent Ibrahim’s (Abraham’s) sacrifice. 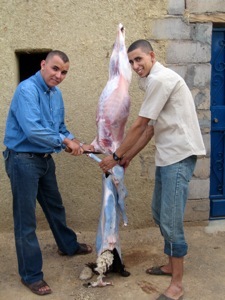 It is also common for Moroccans to share the meat of the animal that is sacrificed during Aïd el-Kebir with those who are less fortunate. If Aïd el-Kebir does not fall within your vacation time for a Morocco Travel experience, then consider letting us be your Morocco Travel guide to one of the Top 6 Most traveled festivals in Morocco. For more information about Aïd el-Kebir and Discover Ouarzaze Tour For more information about Travel and Tours to Morocco plus highlights on Moroccan culture visit Morocco’s Imperial Cities, Seaside Resorts,Sahara Desert, Berber villages, A Taste of Morocco, Magical Kasbahs, Ruins & Waterfalls, Absolute Morocco, The Best of Marrakech, Fes, and Ouarzazate. You are currently browsing the archives for the Aid El Adha Festival category.